Lynair manufactures five different NFPA interchangeable series of cylinders: Series A and Series AL Air Cylinders, Series LH and Series H Hydraulic Cylinders, and Series PW Water Cylinders. Additional Tie Rod Series include CS2 Automotive, F-800 Foundry, AJ Adjustable Stroke, AD Airdraulic, AB Air Booster, and HBA8 and HB4 Air-Hydraulic Boosters, HM ISO Metric Hydraulic, & 'T' Air-Oil Tanks. 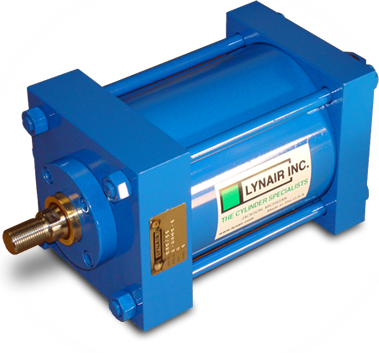 Lynair Manufactures one of the most extensive lines of Tie Rod Cylinders in the industry. The rugged designs of Lynair Cylinders have been proven in some of the most exacting industrial environments. One unique feature of Lynair Cylinders is chrome plated tube I.D., standard on both Air & Hydraulic Cylinders. Lynair also uses Metal to Metal Cushions, which last the life of our cylinders as opposed to floating cushions, or cushion seals, which can fail over time. In addition to Lynair's superior design, we offer outstanding customer service, quick delivery, & competitive pricing, making Lynair Tie Rod Cylinders the best value in the industry.